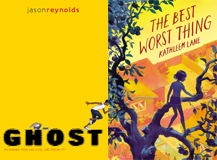 Kathleen Lane, author of The Best Worst Thing, and Jason Reynolds, author of Ghost, in conversation. Moderated by Rosanne Parry. Click here to purchase advance tickets to the festival. Free admission for 17 and younger!